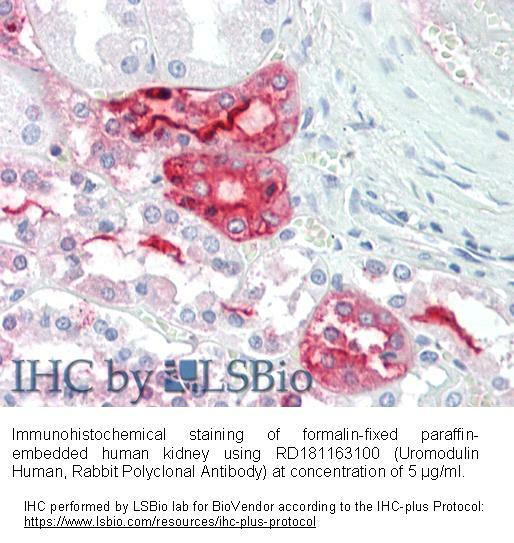 The antibody was raised in rabbits by immunization with the native Human Uromodulin (urine). Immunoaffinity chromatography on a column with immobilized native Human Uromodulin (urine). This product is intended for research use only. Uromodulin (Tamm-Horsfall protein, UMOD) is approx. 85-kDa glycoprotein that is produced in the thick ascending limb of Henle´s loop and early distal convoluted tubules of the nephron. It is a transmembrane protein, which is secreted into the urine through proteolytic cleavage of the glycosylphospha­tidylinositol (GPI) anchor. It belongs to the GPI family. Healthy individuals excrete tens of miligrams of uromodulin per day, making in the most abundant protein in the urine. Uromodulin modulates cell adhesion and signal transduction by interacting with cytokines and it inhibits the aggregation of calcium crystals. By reducing calcium oxalate precipitation, uromodulin plays a protective role with respect to renal stone formation as demonstrated by recent studies on THP- deficient mice prone to nephrolithiasis. THP acts as a host defense factor against urinary tract infections induced by uropathogens such as Esherichia coli, Staphylococcus saphrophyticus, Proteus mirabilis and Klebsiela pneumonie. Uromodulin binds to type 1 fimbriae of Escherichia coli and thereby blocks colonization of urothelial cells. Tamm-Horsfall protein interacts with other molecules and cells including IL-1, IL-2, TNF, IgG, neuthrophils, lymphocytes and monocytes. Binding of uromodulin to neutrophils induces synthesis of IL-8, provokes the respiratory burst and degranulation and stimulates chemotaxis and phagocytosis. Recently, genome-wide association studies identified uromodulin as a risk factor for chronic kidney disease and hypertension. Mutations in the Uromodulin gene are associated with three autosomal dominant tubulo-interstitial nephropathies such as familial juvenile hyperuricemic nephropathy (FJHN), medullary cystic kidney disease (MCKD2) and glomerulocystic kidney disease (GCKD). These disorders are characterized by juvenile onset of hyperuricemia, gout and progressive renal failure.